This doesn&apos;t come on the market everyday. Take a look. 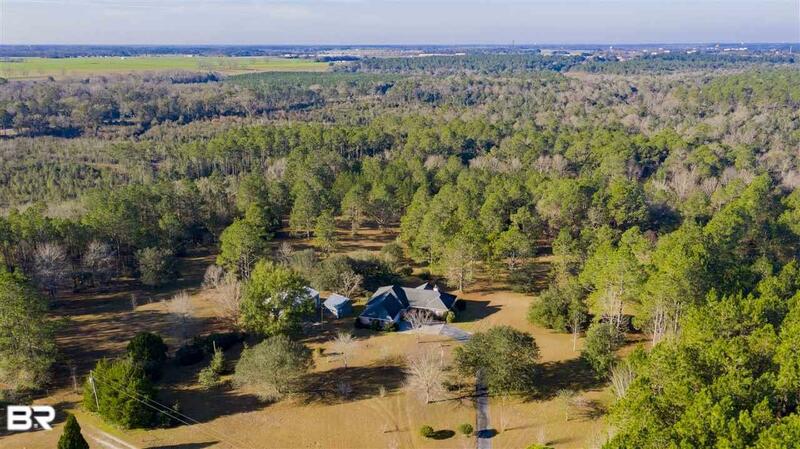 Beautiful 15 Acres dotted with oaks and fruit trees. Unique home in great condition, entire home freshly painted with new roof. Huge Master and Master bath, his/hers closets. Split floor plan with large bedrooms w/ Jack/Jill bath. 1200 foot Walk-out basement with bathroom that can be used for bedroom, playroom, or rental with new tile flooring. Oversized Attached 2 truck garage. Additional 1000 square foot woodworking shop with: countless built-ins, concrete floor, power and water, insulated and finished. 15 acres with shooting stands, deer plots, and room to roam! Private and secluded; yet, convenient - less than 5 minutes to Baldwin Beach Express and I-10, which puts you 30 minutes from anywhere! LISTING BROKER MAKES NO REPRESENTATION TO SQUARE FOOTAGE ACCURACY. BUYER TO VERIFY. Directions: Hwy 59 To Hwy 68, Go East. Take A Left On Hwy 65. Then, Left On Loper Road. Follow Road Around Curve, Then Take A Left On Horseshoe Bend Road. Property Is Down At The Curve Of Road To Your Left. House Sits Off Road On 15 Acres.